Fine conditioner specially formulated for best results. 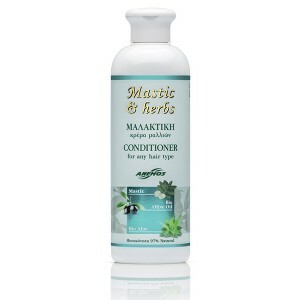 Mastic oil along with the rest of the active ingredients of this conditioner makes your hair healthy, easy to comb, soft and silky. FREE FROM: SLS, SLES, Parabens, Mineral Oil (and derivatives), Petrolatum, Propylene Glycol. With organically grown: Jojoba oil, Olive oil, Aloe Vera. For better results, after washing with shampoo, apply a small quantity of conditioner to wet hair. Allow a couple of minutes for the active ingredients of our conditioner to take effect. Rinse very well. Once a week (or even more frequently) you could use one of our hair masks for silky, strong, shiny, easy to comb hair -especially if you have weak or brittle, or colored hair. You will be surprised by the results!